Download the bhajan-mp3s in a high quality (160 Kbps stereo). Welcome to the site of the S'rîmad Bhâgavatam (or the Bhâgavata Purâna). Here you will find the complete and up-to-date version maintained in Sanskrit, English and Dutch of this most important sacred book of stories of India. India knows many purânas or storybooks, but this collection of stories is generally accepted as being the most complete and important. The book, arranged in twelve so-called cantos, comprises 335 chapters with about 18000 verses. Truly a bible thus [a so-called samhitâ]. 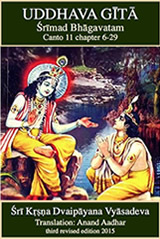 It is this collection of stories that stresses the prime importance of the maintaining aspect of God personified by the transcendental form of Lord Vishnu. 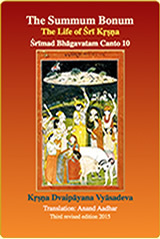 The writer of this book is named Krishna Dvaipâyana Vyâsadeva, also called Bâdarâyana. He is the Lord, the bhagavân, among the philosophers, who in India assembled all the holy texts. He compiled the Vedas, also known as s'ruti, containing the basic wisdom, the mantras for the rituals and the hymns. He also wrote the Mahâbhârata, which is the greatest epic poem in the world. It describes the history (itihâsa) of the great fall that the Vedic culture once made. The Bhagavad Gîtâ is the most important part of it. 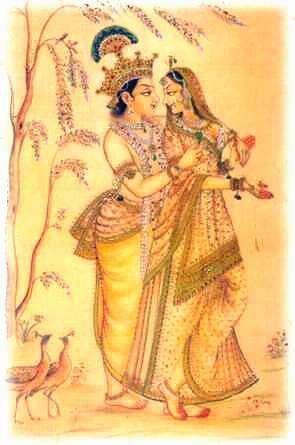 Vyâsa also wrote the rest of the eighteen great story books (the purânas) of India as also the Brahma-sûtra, his masterpiece on the Absolute Truth. 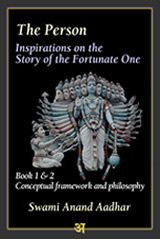 The representative of Vishnu on earth is named the Fortunate One in this book. We know Him specifically by the names of Lord Râma and Lord Krishna. The Fortunate One is thus the Lord who is known in different forms or incarnations, but also the devotees are part of His reality and are also called bhâgavata when they are of pure devotion. Thus there is the Lord in His many appearances, the devotee with as many faces and the book. They are all called Fortunate. To be fortunate means to be of the opulence, or to carry, or live by, the fullness of God's riches, beauty, fame, power, knowledge and detachment. Vyâsa was a grandfather of the Kuru dynasty. He lived a very long time. His long duration of life enabled him to write the story of the Fortunate One and all the other books. He had a son called S'ukadeva who handed the message of this bible down to another member of the family, Emperor Parîkchit, who had difficulty respecting the classical wisdom. This emperor is there as a model for us normal people who seek their stability in the wisdom. This knowledge was conveyed by S'uka in disciplic succession (paramparâ), to those who teach by example (the âcâryas) the science of devotional service (bhakti). This book, and its culture, was brought to the West by the Vaishnava, the Vishnu-monk, Swami A. C. Bhaktivedanta Prabhupâda. Together with his pupils (known as the Hare Krishnas of ISKCON) he realized a verse by verse commented series of books covering the entire Bhâgavatam. This site offers not all these texts (see for that purpose vedabase.net) but does offer under the Creative Commons copyright an as-it-is translation of the verses in a concatenated form complete with the previous version. This text is regularly updated and maintained by Anand Aadhar Prabhu (René P. B. A. Meijer), a dutch psychologist converted to the philosophy of yoga who received instruction in the temples of ISKCON and elsewhere. His predecessor in this duty was S'rî Hayes'var das (Hendrik van Teylingen) who covered most of the translations into Dutch. a - above the a, u and i-letters with an ^ above them. Behind the t and the s with a dot underneath one must place an h.
The s with a ´ above it gets a ' next to it.